Protein Carbonyl ELISA | Cell Biolabs, Inc. The most common products of protein oxidation in biological samples are the carbonyl derivatives of proline, lysine, arginine and threonine residues. Such derivatives are chemically stable and serve as markers for oxidative stress in most types of reactive oxygen species. Our OxiSelect™ Protein Carbonyl ELISA Kit provides a rapid, efficient method for the detection of protein carbonyl residues. The ELISA format is perfect for higher throughput and high sensitivity; we have eliminated concentration and precipitation steps allowing greater sample retention. 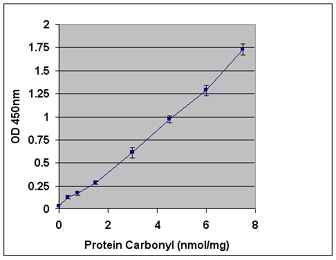 Figure 1: Standard Curve Generated with the OxiSelect™ Protein Carbonyl ELISA Kit. Xia, M. et al. (2016). Remote limb ischemic preconditioning protects rats against cerebral ischemia via HIF-1a/AMPK/HSP70 pathway. Cell. Mol. Neurobiol. doi:10.1007/s10571-016-0444-2. Webb, S.J. et al. (2016). Stress physiology and weapon integrity of intertidal mantis shrimp under future ocean conditions. Sci. Rep. 6:38637. Augustyniak, E. et al. (2016). Validation of protein carbonyl measurement: a multi-centre study. Redox Biol. 4:149-157. Sakellariou, G. K. et al. (2016). Mitochondrial ROS regulate oxidative damage and mitophagy but not age-related muscle fiber atrophy. Sci Rep. doi:10.1038/srep33944. Choi, Y. S. et al. (2016). Preservation of myocardial fatty acid oxidation prevents diastolic dysfunction in mice subjected to angiotensin II infusion. J Mol Cell Cardiol. doi:10.1016/j.yjmcc.2016.09.001. Li, Y. et al. (2016). Visible-light-driven photocatalytic inactivation of MS2 by metal-free gC 3 N 4: Virucidal performance and mechanism. Water Res. doi:10.1016/j.watres.2016.10.009. Laubertova, L. et al. (2016). Oxidative stress markers and their dynamic changes in patients after acute ischemic stroke. Oxid. Med. and Cellular Longev. doi:10.1155/2016/9761697. Yildirim, E. et al. (2016). The impact of protein oxidation on sustained and white coat hypertension. Anatol. J. Cardiol. doi:10.14744/anatoljcardiol.2016.7174. Kinoda, J. et al. (2016). Cytotoxicity of silver nanoparticle and chitin-nanofiber sheet composites caused by oxidative stress. Nanomaterials 6:189. Gutzkow, K. B. et al. (2016). Enhanced susceptibility of obese mice to glycidamide-induced sperm chromatin damage without increased oxidative stress. Andrology.doi:10.1111/andr.12233. Son, M. J. et al. (2016). Evaluation of the anti-fatigue effects of a traditional herbal drug, Gongjin-dan, under insufficient sleep conditions: study protocol for a randomised controlled trial. Trials. 17:418. Guignabert, C. et al. (2016). Dasatinib induces lung vascular toxicity and predisposes to pulmonary hypertension. J Clin Invest. doi:10.1172/JCI86249. Lee, K. Y. et al. (2016). Associations of autophagy with lung diffusion capacity and oxygen saturation in severe COPD: effects of particulate air pollution. Int J Chron Obstruct Pulmon Dis.11:1569-1578. Wang, J. et al. (2016). Activation of the molecular chaperone, sigma 1 receptor, preserves cone function in a murine model of inherited retinal degeneration. Proc Natl Acad Sci U S A. doi:10.1073/pnas.1521749113. Pang, M. et al. (2016). Role of H-Ferritin in radiosensitivity of human glioma cells. J Cancer Biol Treat.3:006. Hocum Stone, L. et al. (2016). Cardiac strain in a swine model of regional hibernating myocardium: Effects of CoQ10 on contractile reserve following bypass surgery. J Cardiovasc Transl Res. doi:10.1007/s12265-016-9696-y. Cimbaljevic, S. et al. (2016). Association of GSTO1 and GSTO2 Polymorphism with Risk of End-Stage Renal Disease Development and Patient Survival. J Med Biochem. 35:1-10. Butterick, T. A. et al. (2016). Pioglitazone increases PGC1-α signaling within chronically ischemic myocardium. Basic Res Cardiol. 111:1-9. Dose, J. et al. (2016). Influence of the APOE genotype on hepatic stress response: Studies in APOE targeted replacement mice and human liver cells. Free Radic Biol Med. doi:10.1016/j.freeradbiomed.2016.04.031. Roy, C. et al. (2016). Evidence that oxidative stress is higher in replacement gilts than in multiparous sows. J Anim Physiol Anim Nutr. doi:10.1111/jpn.12462. Basisty, N. et al. (2016). Mitochondrial-targeted catalase is good for the old mouse proteome, but not for the young:‘reverse’antagonistic pleiotropy? Aging Cell. doi:10.1111/acel.12472. Atabay, V. E., et al. (2016). Obesity and oxidative stress in patients with different periodontal status: a case–control study. J Periodontal Res. doi:10.1111/jre.12368. Fernando, P. M. et al. (2016). Photo-protective effect of sargachromenol against UVB radiation-induced damage through modulating cellular antioxidant systems and apoptosis in human keratinocytes. EnvironToxicol Pharmacol. 43:112-119. Auberval, N. et al. (2016). Beneficial effects of a red wine polyphenol extract on high-fat diet-induced metabolic syndrome in rats. Eur J Nutr. doi:10.1007/s00394-016-1192-2. Yuan, L. et al. (2016). 17β-Estradiol alters oxidative damage and oxidative stress response protein expression in the mouse mammary gland. Mol Cell Endocrinol doi:10.1016/j.mce.2016.02.007. Viringipurampeer, I. A. et al. (2016). NLRP3 inflammasome activation drives bystander cone photoreceptor cell death in a P23H rhodopsin model of retinal degeneration. Hum Mol Genet. doi:10.1093/hmg/ddw029. Dalto, D. B. et al. (2016). The importance of pyridoxine for the impact of the dietary selenium sources on redox balance, embryo development, and reproductive performance in gilts. J Trace Elem Med Biol. doi:10.1016/j.jtemb.2016.01.001. Hamilton, D. J. et al. (2016). Combination of Angiotensin II and L-NG-Nitroarginine methyl ester exacerbates mitochondrial dysfunction and oxidative stress to cause heart failure. Am J Physiol Heart Circ Physiol. doi:10.1152/ajpheart.00746.2015. Fernando, P. M. et al. (2016). Rosmarinic acid attenuates cell damage against UVB radiation-induced oxidative stress via enhancing antioxidant effects in human HaCaT cells. Biomol Ther. 24:75-84. Liu, C. et al. (2015). The Immp2l mutation causes age-dependent degeneration of cerebellar granule neurons prevented by antioxidant treatment. Aging Cell. doi:10.1111/acel.12426. Kim, K. C. et al. (2015). Non-thermal dielectric-barrier discharge plasma damages human keratinocytes by inducing oxidative stress. Int J Mol Med. 37:29-38. Sun, H. et al. (2015). Unveiling the photoelectrocatalytic inactivation mechanism of Escherichia coli: Convincing evidence from responses of parent and anti-oxidation single gene knockout mutants. Water Res. 88:135-143. Hong, Y. & An, Z. (2015). Hesperidin attenuates learning and memory deficits in APP/PS1 mice through activation of Akt/Nrf2 signaling and inhibition of RAGE/NF-κB signaling. Arch Pharm Res. doi:10.1007/s12272-015-0662-z. Ahn, M. Y. et al. (2015). Gene expression profiling and inhibition of adipose tissue accumulation of G. bimaculatus extract in rats on high fat diet. Lipids Health Dis. 14:116. Scholten, S. D. et al. (2015). Effects of vitamin D and quercetin, alone and in combination, on cardiorespiratory fitness and muscle function in physically active male adults. Open Access J Sports Med.6:229-239. Kucukdurmaz, F. et al. (2015). Duration of priapism is associated with increased corporal oxidative stress and antioxidant enzymes in a rat model. Andrologia. doi:10.1111/and.12455. Augustyniak, E. et al. (2015). Validation of protein carbonyl measurement: A multi-centre study. Redox Biol. 4:149-157. Viator, R. J. et al. (2015). Hypoxia-induced increases in glucose uptake do not cause oxidative injury or advanced glycation end-product (AGE) formation in vascular endothelial cells. Physiol Rep. doi: 10.14814/phy2.12460. Kim, H. K. et al. (2015). The link between mitochondrial complex I and brain-derived neurotrophic factor in SH-SY5Y cells–The potential of JNX1001 as a therapeutic agent. Eur J Pharmacol. 764:379-384. Han, X. et al. (2015). Isorhamnetin protects human keratinocytes against ultraviolet B-induced cell damage. Biomol Ther (Seoul). 23:357. Seo, S. W. et al. (2015). Differential tissue-specific function of Adora2b in cardioprotection.J Immunol. doi:10.4049/jimmunol.1402288. Williams, A. S. et al. (2015). Innate and ozone-induced airway hyperresponsiveness in obese mice: role of TNFα. Am J Physiol Lung Cell Mol Physiol. 308:L1168-77. Liu, H. et al. (2015). Allicin protects PC12 cells against 6-OHDA-induced oxidative stress and mitochondrial dysfunction via regulating mitochondrial dynamics. Cell Physiol Biochem. 36:966-979. Johnson, L. & Marks, D. (2015). Treatment of platelet concentrates with the mirasol pathogen inactivation system modulates platelet oxidative stress and NF-κB activation. Transfus Med Hemother. doi:10.1159/000403245. Xia, D. et al. (2015). Red phosphorus: An earth-abundant elemental photocatalyst for “green” bacterial inactivation under visible light. Environ Sci Technol. doi:10.1021/acs.est.5b00531. Campochiaro, P. A. et al. (2015). Is There Excess Oxidative Stress and Damage in Eyes of Patients with Retinitis Pigmentosa?. Antioxid Redox Signal. doi:10.1089/ars.2015.6327. Madduma Hewage, S. R. et al. (2015). Galangin (3, 5, 7-trihydroxyflavone) shields human keratinocytes from ultraviolet B-induced oxidative stress. Biomol Ther (Seoul). 23:165-173. Tremblay, N. & Abele, D. (2015). Response of three krill species to hypoxia and warming: an experimental approach to oxygen minimum zones expansion in coastal ecosystems. Marine Ecology. DOI: 10.1111/maec.12258. Westenbrink, B. D. et al. (2015). Mitochondrial reprogramming induced by CaMKIIδ mediates hypertrophy decompensation. Circ Res. 116:e28-e39. Alway, S. E. et al. (2015). Green tea extract attenuates muscle loss and improves muscle function during disuse, but fails to improve muscle recovery following unloading in aged rats. J. Appl Physiol (1985). 118:319-330. Yu, J. et al. (2015). Influence of chlorpyrifos oxon on the development and progression of Alzheimer's disease in amyloid precursor protein transgenic mice. Neuroimmunology and Neuroinflammation 2:31. Meng, X. et al. (2014). Suppression of NADPH oxidase-and mitochondrion-derived superoxide by Notoginsenoside R1 protects against cerebral ischemia–reperfusion injury through estrogen receptor-dependent activation of Akt/Nrf2 pathways. Free Radic Res. 48:823-838. Magnoni, R. et al. (2014). The Hsp60 folding machinery is crucial for manganese superoxide dismutase folding and function. Free Radic Res. 48:168-179. Wang, L. et al. (2014). p62 provides dual cytoprotection against oxidative stress in the retinal pigment epithelium. Biochim Biophys Acta . 1843:1248-1258. Wolak, N. et al. (2014). Thiamine increases the resistance of baker's yeast Saccharomyces cerevisiae against oxidative, osmotic and thermal stress, through mechanisms partly independent of thiamine diphosphate‐bound enzymes. FEMS Yeast Res. 14:1249-1262. Yang, Y. H. et al. (2014). Oxidative damage to osteoblasts can be alleviated by early autophagy through the endoplasmic reticulum stress pathway—implications for the treatment of osteoporosis. Free Radic Biol Med. 77:10-20. Wang, L. et al. (2014). Nrf2 signaling modulates cigarette smoke-induced complement activation in retinal pigmented epithelial cells. Free Radic Biol Med. 70:155-166. Lin, Y. et al. (2014). Use of sodium butyrate as an alternative to dietary fiber: effects on the embryonic development and anti-oxidative capacity of rats. PLoS One. 9:e97838. Lee, J. H. & Kagan, E. (2014). Role of nicotinamide adenine dinucleotide phosphate oxidase in mediating vesicant-induced interleukin-6 secretion in human airway epithelial cells. Am J Respir Cell Mol Biol. 50:713-722. Auberval, N. et al. (2014). Metabolic and oxidative stress markers in Wistar rats after 2 months on a high-fat diet. Diabetol Metab Syndr. 6:130. Yuan, L. et al. (2014). 17β-Estradiol alters oxidative stress response protein expression and oxidative damage in the uterus. Mol Cell Endocrinol. 382:218-226. Dai, D. F. et al. (2014). Altered proteome turnover and remodeling by short‐term caloric restriction or rapamycin rejuvenate the aging heart. Aging Cell. 13:529-539. Evran, B. et al. (2014). Effects of carnosine on prooxidant–antioxidant status in heart tissue, plasma and erythrocytes of rats with isoproterenol-induced myocardial infarction. Pharmacol Rep. 66:81-86. Akki, A. et al. (2014). Skeletal muscle ATP kinetics are impaired in frail mice. Age (Dordr). 36:21-30. Zheng, J. et al. (2014). Photo-protective effect of americanin B against ultraviolet B-induced damage in cultured human keratinocytes. Environ Toxicol Pharmacol. 38:891-900. Fishman, J. E. et al. (2014). Intraluminal nonbacterial intestinal components control gut and lung injury after trauma hemorrhagic shock. Ann Surg. 260:1112-1120. Zheng, J. et al. (2014). Americanin B protects cultured human keratinocytes against oxidative stress by exerting antioxidant effects. In Vitro Cell Dev Biol Anim. 50:766-777. Chen, R. et al. (2014). Up-regulation of mitochondrial chaperone TRAP1 in ulcerative colitis associated colorectal cancer. World J Gastroenterol. 20:17037-17048. Piao, M. J. et al. (2014). Gracilaria bursa-pastoris (Gmelin) silva extract attenuates ultraviolet b radiation-induced oxidative stress in human keratinocytes. J Environ Pathol Toxicol Oncol. 33:33-43. Janssens, L. & Stoks, R. (2014). Reinforcing effects of non-pathogenic bacteria and predation risk: from physiology to life history. Oecologia .176:323-332. Meng, X. et al. (2014). Notoginsenoside R1-mediated neuroprotection involves estrogen receptor-dependent crosstalk between Akt and ERK1/2 pathways: A novel mechanism of Nrf2/ARE signaling activation. Free Radic Res. 48:445-460. Hyun, Y. J. et al. (2014). Photoprotective effect of a Polyopes affinis (Harvey) Kawaguchi and Wang (Halymeniaceae)-derived ethanol extract on human keratinocytes. Trop J Pharm Res. 13:863-871. Wiegman, C. H. et al. (2014). A comprehensive analysis of oxidative stress in the ozone-induced lung inflammation mouse model. Clin Sci (Lond). 126:425-440. Oleśkowska‐Florek, W. et al. (2014). Hemodialysis‐induced changes in the blood composition affect function of the endothelium. Hemodial Int. 18:650-656. Viringipurampeer, I. A. et al. (2014). Rip3 knockdown rescues photoreceptor cell death in blind pde6c zebrafish. Cell Death Differ. 21:665-675. Janssens, L. & Stoks, R. (2014). Chronic predation risk reduces escape speed by increasing oxidative damage: a deadly cost of an adaptive antipredator response. PLoS One. 9:e101273. Yao, C. W. et al. (2014). Cytoprotective effects of 6′-O-galloylpaeoniflorin against ultraviolet B radiation-induced cell damage in human keratinocytes. In Vitro Cell Dev Biol Anim. 50:664-674. Yuan, Y. et al. (2014). Markers of macromolecular oxidative damage in maternal serum and risk of neural tube defects in offspring. Free Radic Biol Med. doi:10.1016/j.freeradbiomed.2014.12.014. Meng, X. et al. (2014). Attenuation of Aβ25-35-induced parallel autophagic and apoptotic cell death by gypenoside XVII through the estrogen receptor-dependent activation of Nrf2/ARE pathways. Toxicol Appl Pharmacol. 279:63-75. Marjanovic, A. M. et al. (2014). Cell oxidation-reduction imbalance after modulated radiofrequency radiation. Electromagn Biol Med. 13:1-6. Piao, M. J. et al. (2014). Phloroglucinol inhibits ultraviolet B radiation-induced oxidative stress in the mouse skin. Int J Radiat Biol. 90:928-935. Sutkowy, P. et al. (2014). Physical exercise combined with whole-body cryotherapy in evaluating the level of lipid peroxidation products and other oxidant stress indicators in kayakers. Oxid Med Cell Longev. doi: 10.1155/2014/402631. Kang, K. A. et al. (2014). Fisetin attenuates hydrogen peroxide-induced cell damage by scavenging reactive oxygen species and activating protective functions of cellular glutathione system. In Vitro Cell Dev Biol Anim. 50:66-74. Sosnowska, D. et al. (2014). A Heart that Beats for 500 Years: Age-Related Changes in Cardiac Proteasome Activity, Oxidative Protein Damage and Expression of Heat Shock Proteins, Inflammatory Factors, and Mitochondrial Complexes in Arctica islandica, the Longest-Living Noncolonial Animal. J Gerontol A Biol Sci Med Sci. 69:1448-1461. Al-Khalili, L. et al. (2014). Proteasome Inhibition in Skeletal Muscle Cells Unmasks Metabolic Derangements in Type 2 Diabetes. Am J Physiol Cell Physiol. 307:C774-C787. Ravikumar, P. et al. (2014). α-Klotho Protects Against Oxidative Damage in Pulmonary Epithelia. Am J Physiol Lung Cell Mol Physiol. 307:L566-575. Liu, C. et al. (2014). Decreased DJ-1 Leads to Impaired Nrf2-Regulated Antioxidant Defense and Increased UV-A-Induced Apoptosis in Corneal Endothelial Cells. Invest Ophthalmol Vis Sci. 55:5551-5560. Farmer, C. et al. (2014). Effects of the plant extract silymarin on prolactin concentrations, mammary gland development, and oxidative stress in gestating gilts. J Anim Sci. 92:2922-2930. Olesen, J. et al. (2014). Exercise training, but not resveratrol, improves metabolic and inflammatory status in skeletal muscle of aged men. J. Physiol. 592:1873-1886. Vulesevic, B. et al. (2014). Glyoxalase-1 Overexpression in Bone Marrow Cells Reverses Defective Neovascularization in STZ-induced Diabetic Mice. Cardiovasc Res. 101:306-316. Soare, A. et al. (2013). Multiple dietary supplements do not affect metabolic and cardiovascular health. Aging (Albany NY). 6:149-157. Zhao, Y. et al. (2013). Effect of Social Ranks and Gestation Housing Systems on Oxidative Stress Status, Reproductive Performance, and Immune Status of Sows. J Anim Sci. 91:5848-5858. Di Cara, F. et al. (2013). Invadolysin, a Conserved Lipid-Droplet-Associated Metalloproteinase, is Required for Mitochondrial Function in Drosophila. J. Cell Sci. 126:4769-4781. Dai, D. F. et al. (2013).Global Proteomics and Pathway Analysis of Pressure-Overload–Induced Heart Failure and Its Attenuation by Mitochondrial-Targeted Peptides. Circ Heart Fail. 6:1067-1076. Camps, E. et al. (2013). APP/PS1 Mice Overexpressing SREBP-2 Exhibit Combined Aβ Accumulation and Tau Pathology Underlying Alzheimer's Disease. Hum. Mol. Genet. 10.1093/hmg/ddt201. Ungvari, Z. et al. (2013). Testing Predictions of the Oxidative Stress Hypothesis of Aging Using a Novel Invertebrate Model of Longevity: The Giant Clam (Tridacna Derasa). J Gerontol A Biol Sci Med Sci. 68:359-367. Young, K. et al. (2013). Each to Their Own: Skeletal Muscles of Different Function use Different Biochemical Strategies During Aestivation at High Temperature. J.Exp. Biol. 216:1012-1024. Fishman, J. et al. (2012). Oxidative Modification of the Intestinal Mucus Layer is a Critical but Unrecognized Component of Trauma Hemorrhagic Shock-Induced gut Barrier Failure. Am J Physiol Gastrointest Liver Physiol. 304:G57-G63. Murakami.Y. et al. (2012). Receptor Interacting Protein Kinase Mediates Necrotic Cone but Not Rod Cell Death in a Mouse Model of Inherited Degeneration. PNAS. 10.1073/pnas.1206937109. Gannon, A.M. et al. (2012). Cigarette Smoke Exposure Leads to Follicle Loss via an Alternative Ovarian Cell Death Pathway in a Mouse Model. Toxicol. Sci. 125:274-284. Tighe, R.M. et al. (2011). Ozone Inhalation Promotes CX3CR1-Dependent Maturation of Resident Lung Macrophages that Limit Oxidative Stress and Inflammation. J. Immunol. 187:4800-4808. Tang, H. et al. (2011). Intrinsic Apoptosis in Mechanically Ventilated Human Diaphragm: Linkage to a Novel Fos/FoxO1/Stat3-Bim Axis. FASEB J. 25:2921-2936. Roh, M.I. et al. (2011). Edaravone, an ROS Scavenger, Ameliorates Photoreceptor Cell Death after Experimental Retinal Detachment. Invest. Ophthalmol. Vis. Sci. 52:3825-3831. Robinson, C.K. et al. (2011). A Major Role for Nonenzymatic Antioxidant Processes in the Radioresistance of Halobacterium salinarum. J. Bacteriol. 193:1653-1662..
Dai, D.F. et al. (2011). Mitochondrial Targeted Antioxidant Peptide Ameliorates Hypertensive Cardiomyopathy. J. Am. Coll. Cardiol. 58:73-82. Thompson, C.M. et al. (2011). Investigation of the Mode of Action Underlying the Tumorigenic Response Induced in B6C3F1 Mice Exposed Orally to Hexavalent Chromium. Toxicol. Sci. 123:58-70. Ungvari, Z. et al. (2011). Extreme Longevity Is Associated With Increased Resistance to Oxidative Stress in Arctica islandica, the Longest-Living Non-Colonial Animal. J. Gerontol A Biol Sci Med Sci. 10.1093/gerona/glr044. Labbé, A. et al. (2010). Resveratrol Improves Insulin Resistance Hyperglycemia and Hepatosteatosis But Not Hypertriglyceridemia, Inflammation, and Life Span in a Mouse Model for Werner Syndrome. J. Gerontol. A Biol Sci Med. Sci. 10.1093/gerona/glq184. Nolin, T.D. et al (2010). Multiple-Dose Pharmacokinetics and Pharmacodynamics of N-Acetylcysteine in Patients with End-Stage Renal Disease. Clin. J. Am. Soc. Nephrol. 5:1588-1594. Kang, K.A. et al. (2010). KIOM-4 Protects Against Oxidative Stress-Induced Mitochondrial Damage in Pancreatic ß-Cells via its Antioxidant Effects. Evid. Based Complement. Altern. Med. 10.1093/ecam/neq007. Cho, H-Y. et al. (2009). Antiviral Activity of Nrf2 in a Murine Model of Respiratory Syncytial Virus (RSV) Disease. Am. J. Respir. Crit. Care Med. 179:138-150. Neretti, N. et al. (2009). Long lived Indy induces reduced mitochondrial reactive oxygen species production and oxidative damage. PNAS 106:2277-2282. Kim, S-H. et al. (2008). Protective Effect of Esculetin Against Oxidative Stress-Induced Cell Damage via Scavenging Reactive Oxygen Species. Acta Pharmacol. Sinica 29(11):1319-1326. Paromov, V. et al. (2008). The Influence of N-acetyl-L-cysteine on Oxidative Stress and Nitric Oxide Synthesis in Stimulated Macrophages Treated with a Mustard Gas Analogue. BMC Cell Biology 9:33. Lowry, M. et al. (2008). Lung Lining Fluid Glutathione Attenuates IL-13 Induced Asthma. Am. J. Respir. Cell Mol. Biol. 38(5):509-516.